The Outlaw’s Ransom is OUT NOW on KINDLE!! Every single book I am lucky enough to have published means a lot to me. Writers talk about ‘putting something of themselves’ into their work – and it’s true. For the months while we are writing a story, we live it- breathe it- sweat over it- and become part of it. This book however- which will become a series of 5 novels called The Folville Chronicles– has a special place in my heart. For a start, it was inspired by my love of the stories of Robin Hood – but it isn’t about him. 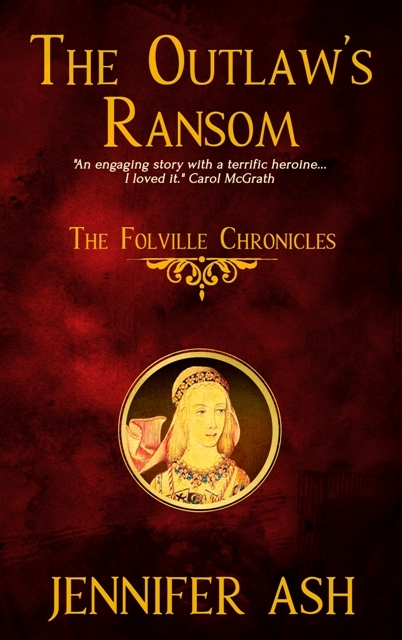 It’s about a family who took crime as their way of life in the Fourteenth Century- the Folvilles. The parallels between their real lives and the stories of Robin Hood have not gone unnoticed by historians- including myself. I studied the Folvilles in depth for five years back in the 1990’s- and I knew then that they had a story worth telling. Writing a novel about the Folville brothers was only a distant dream back then. I had never written anything other than essays and research papers- 24 years later things are rather different… I now have one or two novels under my belt. It wasn’t until I wrote Romancing Robin Hood however, that I felt brave enough to have a go at writing a medieval crime series. Something I was encouraged in by the good folk I met at the last Hooded Man Event in 2016 (A conference/event for Robin of Sherwood fans), where I was selling my earlier novels. Those of you who have read Romancing Robin Hood, will already recognise The Outlaw’s Ransom. It is the same tale of Mathilda of Twyford that appears within my Jenny Kane novel. However- it has been expanded slightly, with more history added in. The story I must stress- IS THE SAME. If you want a new Mathilda story you will not have to wait long- Book Two of The Folville Chronicles- The Winter Outlaw– will be out next month. The Outlaw’s Ransom will also be out in paperback very soon.